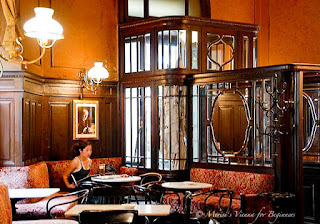 "... it must be said that the Viennese coffeehouse is a particular institution which is not comparable to any other in the world. As a matter of fact, it is a democratic club to which admission costs the small price of a cup of coffee. Upon payment of this mite every guest can sit for hours on end, discuss, write, play cards, receive his mail, and, above all, can go through an unlimited number of newspapers and magazines." A daily blogger since 2005, Merisi challenges City Daily Photo bloggers from around the world to show us scenes from coffee places in their own neighbourhoods. I feel immensely grateful for the honour of having been allowed to select this month's Theme Day topic, and am looking forward to see what is going on in your coffee places! Amsterdam Café looks like a very cozy place to stop for coffee or tea. What beautiful, lively scene from a coffee house, love it! Love your beautiful coffee house scene! Unfortunately I was not able to comment on your blog.